Dare you look into the eyes of your own death? Make no mistake, this is not a morbid text requiring that we face the inevitable. It is rather a testament to life and an exploration of what gives life meaning. 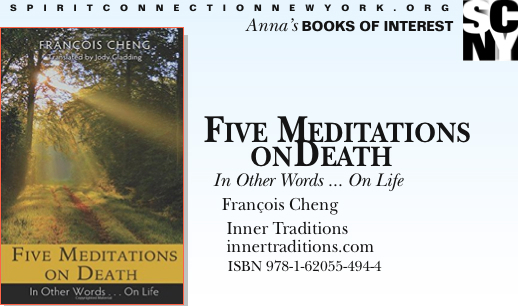 It can be viewed as synchronicitous that this book has been released at a time when facing death has become an unavoidable topic around the world. It is almost constantly in the media at the moment, and as journalists and talking heads search for new ways to talk about what is happening at an alarmingly increasing rate, they are also stumbling across keys to giving meaning to death beyond the mundane experience and the power that it summons as a weapon in the material world. Written in soaring language, filled with poetry from across the ages, Cheng begins by describing himself as coming from the tribe of the damned, the have-nots. The five meditations were originally presented orally and maintain that interactive quality within the printed words. Readers engage in exploration with Cheng rather than being passively informed by him. © Copyright 2019. Spirit Connection New York. All Rights Reserved.